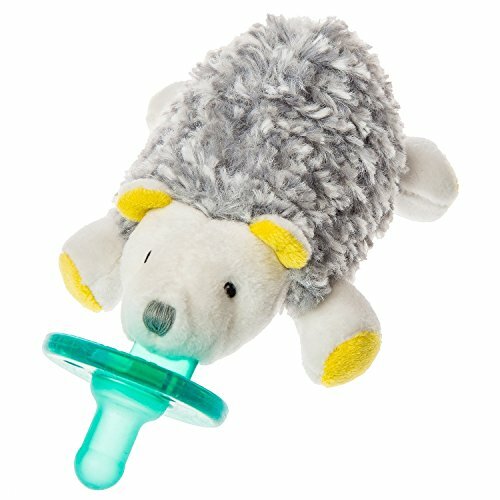 Get the security of Wubbanub, the experts in safe, birthing center approved pacifier toys, with the comfort and cuteness of Mary Meyer. Exclusive Mary Meyer designs that coordinate with the rest of the Mary Meyer infant collection are combined with the patented design of Wubbanub. Latex free. BPA, PVC, and Phthalate free. Permanently attached pacifier helps prevent the "missing pacifier" problem. Little legs on plush toy are perfect size for little hands to hold on to. No cords or clips. Machine wash. // Based in Vermont, Mary Meyer is an environmentally conscious company, including receiving 100% of its energy from the renewable energy of Central Vermont Power Service's Cow Power Program. Recipients of multiple Oppenheim and Toy of the Year awards, Mary Meyer has been making toys that are safe and fun for more than 75 years. Soft and cuddly, with arms and legs that are easy for little hands to hold on to. Sunshine Hedgehog Wubbanub is 6" long and arrives in internet friendly packaging.